Earlier today, Canadian Business and Maclean’s released its 30th annual Growth 500 list, and we’re proud to announce that we’ve made the list for the second, consecutive year. Digital Echidna ranks as no. 241 with a five-year revenue growth of 285 per cent. First, the details. Then, the more important part -- the acknowledgements. The Growth 500 list measures five-year revenue growth. For this edition, our growth from 2012-2017 was measured. 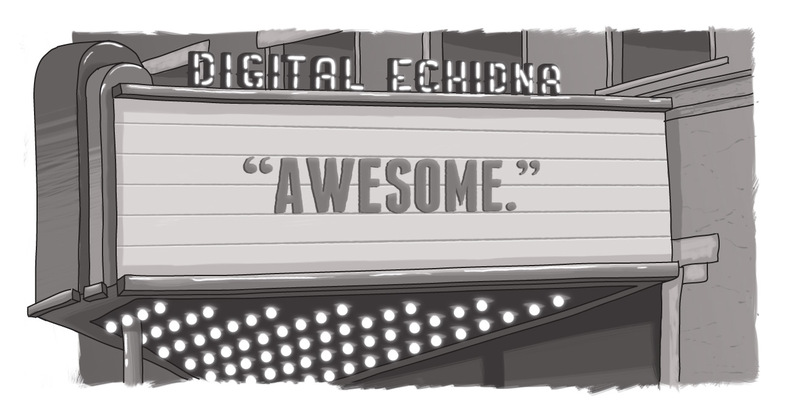 And this represents an incredible time in Echidna’s history. In 2012 were just settling into the second floor of the Burridge Block, we had just signed our first major hospital account, we were ramping up operations from a team of 15. By the next year, we had doubled in size, jumped on the space vacated by Cello (remember that restaurant Londoners? ), and were continuing to build our team both in terms of depth and breadth -- living our commitment to provide our clients with a comprehensive team from account management to creative and content to project management and development. Over that five-year period, revenue grew -- 285 per cent -- as did our size (now close to 70 and growing) but, equally as impressive, our scope and influence grew. We received accolades for our commitment to accessibility (including receiving the prestigious provincial David C. Onley award for leadership), we were recognized as industry leaders in Drupal development, and our belief in supporting our community through sharing our time, talents, and resources was acknowledged with corporate social responsibility awards both from TechAlliance and the London Chamber of Commerce. We’ve grown -- and continued to grow. We expanded onto yet another fourth floor of the Burridge Block (a parade of Echidnas surrounding Laurie Lashbrook and her team!) and we increased our presence across North America, becoming a go-to development firm for enterprise-level solutions for clients across the board, but especially in healthcare, education, and not-for-profit/government industries. In 2018 we vacated all floors of the Burridge Block building, moving on to a new spot at 148 York Street. But -- and here come the acknowledgements -- all this growth is thanks to the dedication, support, and commitment of the people who believe in us and have supported our efforts. Internally, our growth has been built upon a foundation of excellence that’s come about from alignment to our core values: humble confidence; dedication and reliability; being a team player; being engaged and passionate in our efforts; and always learning and improving. As we charted a path to success, we knew we had to have many hands all rowing in the same direction -- and we’re proud of the team we’ve developed (and the support of those who have moved on to other opportunities). Externally, we have to thank our clients. Our most recent launches, Michael Garron Hospital and the Michael Garron Hospital Foundation, may be a long way from the sole-proprietorship early days working with amazingly supportive people like Larry Kinlin and Steve Glickman, but, at the core, we approach every project trying to do our best for our clients and ensure that their needs and goals are met. Our tools, tactics, and processes may have changed, but one thing that hasn’t changed -- from the early days to where we’re now working on enterprise-level, multi-user, multidimensional projects -- is our commitment to the end user. And that’s helped us get where we are. And, of course, I’d be remiss to not thank the amazing community of supporters we’ve been lucky enough to work with -- and continue to work with -- in London itself. We’ve developed wonderful relationships with colleagues, mentors -- and even competitors. Our partnerships with institutions like Fanshawe College and Western University aren’t just about short-term needs, but rather are shared efforts to grow and improve our city as a destination for tech talent. Our CSR efforts focused on children, culture, and the environment are all designed with an eye towards making our community more livable and sustainable for generations to come. And, of course, our commitment to the downtown core is part of our efforts to help revitalize this incredible city -- a city that’s our home. Thank you again to everyone who has believed in us and supported us over the year. We’re proud of this recognition and again being one of several London area companies on this list. We look forward to continuing to reward the faith that has been placed in us -- by our families, by our community, and by our clients. What London companies are on the 2018 GROWTH 500 List of fastest-growing companies?